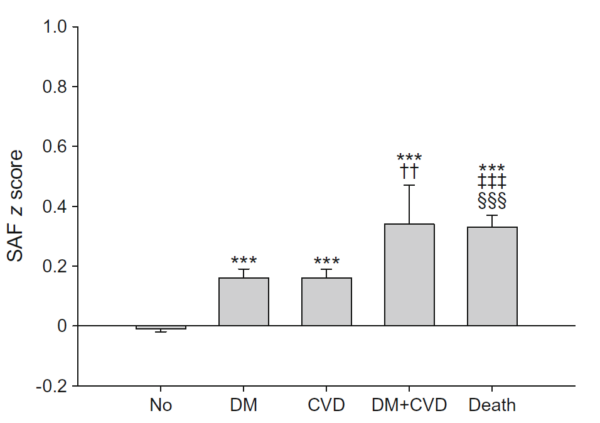 Individuals were diagnosed with incident type 2 diabetes by self-report or by a fasting blood glucose ≥ 7.0 mmol/l or HbA1c ≥ 48 mmol/mol (≥6.5%) at follow-up. Participants were diagnosed as having incident CVD by self-report. CVD includes myocardial infarction, coronary interventions, cerebrovascular accident, transient ischaemic attack, intermittent claudication or vascular surgery. Mortality was ascertained using the Dutch Municipal Personal Records Database.